making it move beyond its own esthetical and geographical bounderies. 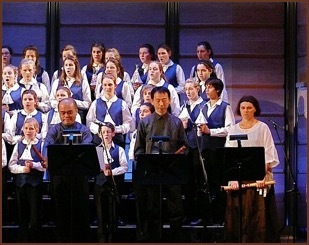 During the 20th century the shakuhachi opens to all the musical styles, and the Japanese composers, initially trained in the western style, come back, from the 1960s, to the music and the traditional instruments of their own culture. They find common points with their concern of the moment: a dominant relation to sound and the use of silence as an expressive strength. The first ones are Toru Takemitsu (1930-1996) together with Katsuya Yokoyama (shakuhachi) and Kinshi Tsuruta (biwa), and Makoto Moroi (1930-2013). 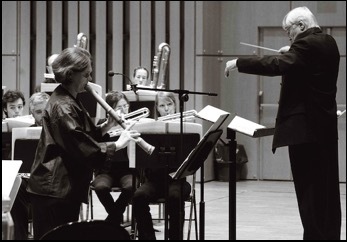 Going out of its own geographical borders, from the 1970s, the shakuhachi never stopped interesting the western composers: first in USA, then in Australia where has been created a competition of new compositions for chamber music with shakuhachi, and more recently in Europe. 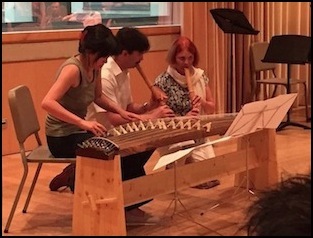 Specifically since 2013, new compositions for the shakuhachi have been providing throw the annual European Shakuhachi Summerschools and Festivals. 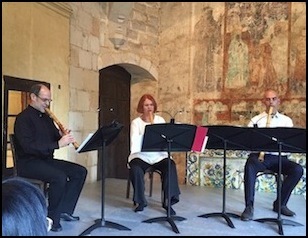 .........concert "Masters of Japanese Music in the Cloisters"